On the occasion of representing the United States of America at the 57th International Art Exhibition, the Venice Biennale, US artist Mark Bradford met with Rio Terà dei Pensieri. After being intrigued and inspired by the stories and projects undertaken by the organization, Bradford wanted to visit the prison work spaces in person, meet the inmates in both prisons, and share some phases of the work with them. His knowledge and keen sensitivity with respect to the issues of hardship and social redemption led him to give life to Process Collettivo. The project will use the world stage of the Biennale to bring attention and support to social partnership models that intervene in the penitentiary system by creating employment opportunities for inmates and those who have recently returned to freedom. Prison work today has become a widespread reality that has spread to almost every region. The belief that even while incarcerated you can gain quality work experience, ofering people in reclusion the opportunity to have small pockets of freedom, exchange, and satisfaction, has become one that many people hold. As a non-profit organization, Rio Terà dei Pensieri is contributing to this cultural change. Process Collettivo will initially collaborate with Rio Terà dei Pensieri for six years, with the aim of increasing employment and training opportunities within prisons and the city of Venice. Building on the existing structure with non-profit laboratories and workspaces, Bradford has promoted the opening of a shop in the historic center of Venice near the Church of the Frari. This shop creates awareness and sells goods to the public and many of the visitors passing through, ofering the handmade products made by the inmates (bags and accessories, T-shirts, and natural cosmetics). This shop will also provide new job opportunities for people recently released from prison and will be a reference point for former inmates regarding information on services available in the city, including access to training, employment, housing and health services. All proceeds from the sales will go to support projects providing work to Rio Terà dei Pensieri inmates and new and upcoming projects that will be promoted through Process Collettivo. In occasion of the first year celebration of the collaboration between Mark Bradford and Rio Terà dei Pensieri through the Process Collettivo project Bradford has entrusted the architect Fabiola Bazzo with a new project to highlight the various paths of rehabilitation that are being undertaken by women and men in the penitentiary system. Mark went into the prisons with cooperative members to become familiar with the activities and the projects. He talked with inmates and received their stories, ideas, desires. Mark identified the importance of opening of an outlet in central Venice, the opportunity to let grow and spread the cooperative projects. Mark wanted to engage personally, hosting a person just leaving the prison as an assistant in the setting up of the US pavilion at the Biennale, and later as part of the group of people that during all the Biennale period welcomed and took visitors around the pavilion. Cooperative work must be known by a wider public, hence the promotion in the US museums and thoughout the Hauser & Wirth gallery. Hence also the production of a documentary video about the collaboration and the project. The external sight stimulated the cooperative members to work on communication and on the representation they give of themselves, to make more effective the communication of the project. In May 2017 for the opening of the Process Collettivo Shop & Resource Center and Mark Bradford’s exhibition “Tomorrow is another day” at the 57th Venice Biennale, the Bradford Collection launched with the first limited edition bag for the “Malefatte” brand. 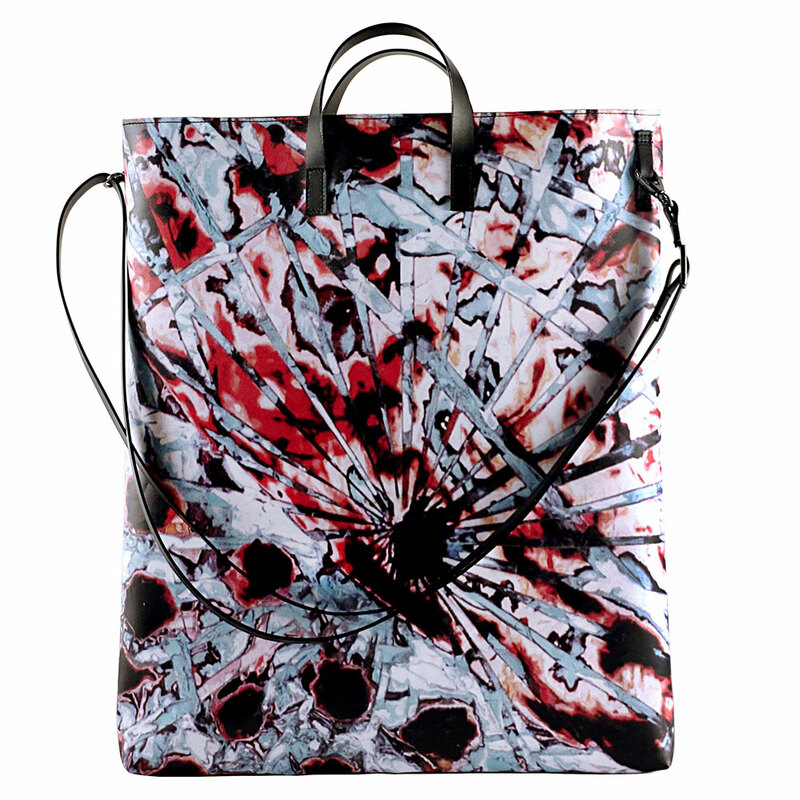 This bag was created at the external manufacturing lab in collaboration with the American artist and his team. For this first limited edition bag, one hundred bags were created in six versions with the essential lines and geometric aspects recalling details of Bradford’s work, The next hot line (2014). Rio Terà dei Pensieri collaborated with the Venetian designer Isotta Dardilli on the creation of this special edition bag. Dardilli moved to Treviso in 2002 for a ten-year collaboration with Fabrica, the Benetton group’s research center, in the field of art direction and graphic design. In 2012 she founded Isotype Studio. Dardilli lectures in the Department of Design Culture, Fashion Design and Multimedia Arts at the IUAV University, Venice. 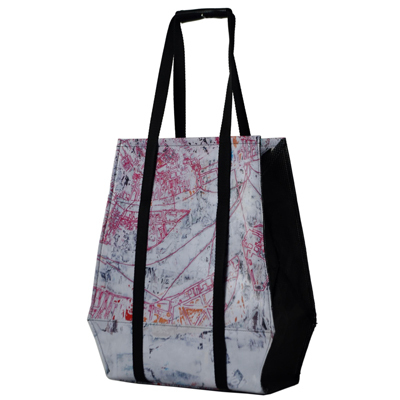 The new Mark Bradford Limited Edition Bag is now available! 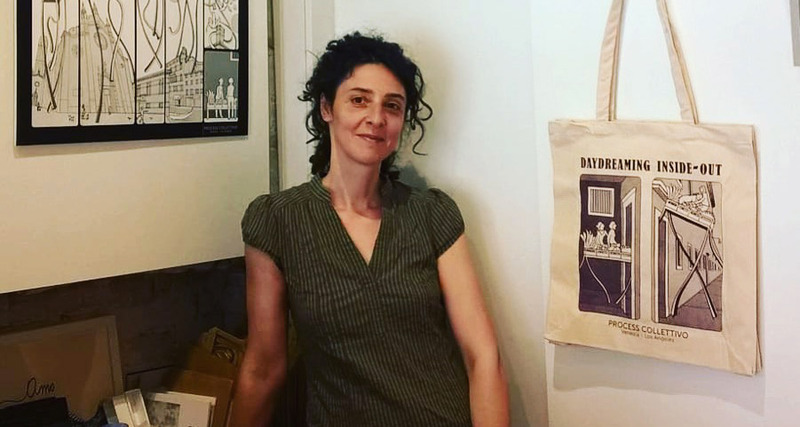 This bag has been created to promote Art supports job training in prison, the fundraising campaign​ to support no profit ​ Rio Terà dei Pensieri and its social activity. The inspiration came from Bradford himself and in the spirit of this second edition, there is a new design with newly printed work: And so the Trojans buried Hector breaker of Horses, 2017. Rio Terà dei Pensieri entrusted the project to architect and designer Francesco Tencalla, who designed the new bag in collaboration with Giada Mambrin. “I saw the beginning of this project. I saw the growth and development in collaboration with RTdP and the city of Venice and the opening of the Process Collettivo shop & resource center. I saw the many events that developed around the initiative, which allowed me to combine the passion for art I always felt as a child, together with my experiences of volunteering in the Brazilian favelas. I have had to show much determination, creativity, availability and openness – on top of many sleepless nights – for something that none of us previously understood: the importance of work and how it allows people to change their lives and feel part of society again. "Malefatte": one-of-a-kind and original bags and accessories, produced by prisoners with recycled PVC. Every one of our products is special since it contains the story of the hands that created it, made of a painful past, a hard-working present, and someone waiting for a better future.